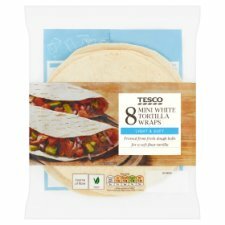 8 Mini plain wheat tortilla wraps. For mini party pizzas, top with tomato passata and grated cheese. Place on a tray,bake until edges are golden brown. Light & Soft. Pressed from fresh dough balls for a soft flour tortilla. INGREDIENTS: Wheat Flour (Wheat Flour, Calcium Carbonate, Iron, Niacin, Thiamin), Water, Palm Oil, Humectant (Glycerol), Raising Agents (Disodium Diphosphate, Sodium Bicarbonate), Sugar, Emulsifier (Mono- and Di-Glycerides of Fatty Acids), Acidity Regulator (Citric Acid), Salt, Preservative (Calcium Propionate), Flour Treatment Agent (L-Cysteine Hydrochloride). Once opened, keep refrigerated and use within 2 days and by date shown. 1 tortilla (800W) 8 seconds, (900W) 6 seconds.